44 TheHorse.com THE HORSE February 2018 N o matter the discipline, a competi- tor's success and earnings are only as great as his or her horse's health and soundness. That's particularly true among rodeo participants. They must abide by Professional Rodeo Cowboys Association (PRCA) guidelines for horse care or face penalties and fines. This goes for the saddle horses used for timed events or as pickup horses (used to assist the bronc- and bull-riding cowboys), as well as for the broncs. All PRCA-sanctioned rodeos are required to have a licensed veterinarian present during performances. Veterinar- ians and staff are trained and prepared to offer immediate assistance and medical care to any injured horse. In this article we'll learn more about these athletes, the types of injuries to which they are prone, and how veterinar- ians nurse them back to health and glory. Bucking Horses You might think bucking horse are ill-behaved grade animals, but they're far from it. Rather, they're intentionally bred for their inclination to buck and are con- siderably valuable, often insured for five to six figures. Owners endeavor to keep them sound just as they do performance horses. Ben Espy, DVM, Dipl. ACT, an equine practitioner based in San Antonio, Texas, and a consultant on the PRCA's Animal Care and Welfare Committee, provides insight into these horses' lifestyles. His equine practice focus is professional rodeo horses, and he has headed the San Antonio Stock Show and Rodeo's veteri- nary services for the past 20 years. When bucking prospects are born, says Espy, they live wild lives without human contact other than for preventive care. "They are left to their own devices until they are gathered at 4 to 5 years of age," he says. "Then bucking horses are tested for their propensity to buck using man- nequins or willing cowboys." If the horse bucks, he is separated into a bucking group; if not, he is pointed toward being a pickup mount or another working horse. 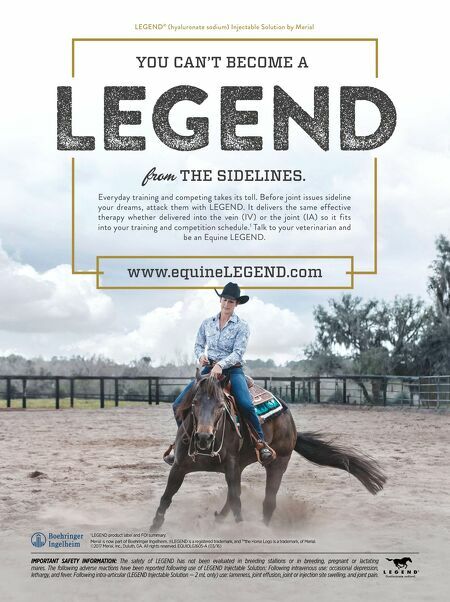 Espy stresses that the sheepskin-lined flank strap does not stimulate a horse to buck; that characteristic is innate and bred into the horses. "There is an art to placing and tightening a flank strap," he says. "If too tight, it will actually re- strain a horse from bucking. The horse that bucks will do so because it is in its nature; the flank strap simply ensures this tendency once the bucking starts. Many people will notice that during the time the horse is in an arena, the bucking horse continues to buck even after the flank strap is removed." Bucking horses might participate in ro- deos 10 months out of a year, but they are only allowed to buck twice every seven days. Their "work" lasts around eight seconds, or 16 seconds a week. The San Antonio Rodeo, for example, features the top 50 competitors in the world and draws both the best cowboys and the best stock. 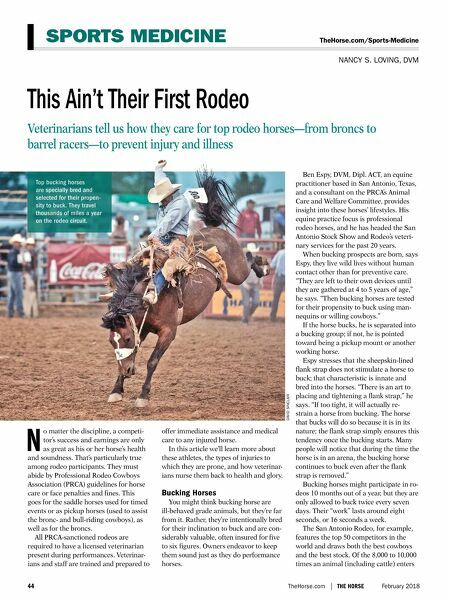 Of the 8,000 to 10,000 times an animal (including cattle) enters SPORTS MEDICINE NANCY S. LOVING, DVM TheHorse.com/Sports-Medicine This Ain't Their First Rodeo DAVID SINCLAIR Veterinarians tell us how they care for top rodeo horses—from broncs to barrel racers—to prevent injury and illness Top bucking horses are specially bred and selected for their propen- sity to buck. They travel thousands of miles a year on the rodeo circuit.